Thank you for visiting our website. Since you have decided to view our site out of the thousands of other possibilities, it is probable that your business in need of Credit Card Processing Services. 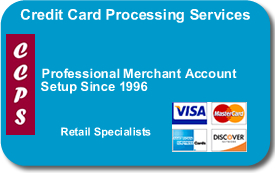 Whether you operate a chain of retail stores, an independent restaurant, have a medical practice, seek to conduct commerce on the Internet, or are just starting a new home-based business, Credit Card Processing Services, Inc. (CCPS) can assist your business in designing the best processing program for your company. Our discount rates are extremely competitive and our equipment programs are the best in the industry. I have put together wonderful programs that include free terminals (including wireless terminals) and free setup for the Authorize.Net gateway. I have posted on our website the pricing for each of our many programs in order to help you make a decision. Please print out each of the pages that interest you so that you will have a hard copy to review and compare to other offers in the marketplace. I am sure that you will find at least one of my programs to be a perfect fit for your business. If you have any questions at all then I encourage you to either call or email me directly so that I can personally recommend a few options for you to consider. Over the years Credit Card Processing Services has developed relationships with the best companies in the merchant account business. We constantly evaluate what is good for our customers and then develop good programs to offer you. CCPS represents most all of the major processing networks and provides the best processing equipment in the industry today. I would like to give you insight into who Credit Card Processing Services is and why we are your best choice when selecting a credit card processor for your business. We are a small family run company who treats each of our clients like family. Kevin Aniess (President) has over 25 years of professional credit card industry experience. This experience includes coordinating marketing programs for more than 10 major banks and seven years of sales and managerial experience with a major credit card processor. Since 1996, when Credit Card Processing Services was formed, I have personally conducted all of the sales and customer servicing whenever one of my thousands of merchants have called. Every merchant is provided a 24/7 customer support number from our processors, yet I am always happy to receive a call directly from my merchant clients. I made a decision about 10 years ago that I would not hire outside sales reps but instead provide personal service to every one of my merchant clients no matter how big or small. I believe that my merchants appreciate this knowing that they can always contact me no matter if there is an issue that needs to be resolved or if they need service for an additional location or one of their friends. I am joined by my wife Rhonda who keeps track of the books and all financial matters. Rhonda’s family owned a small women’s clothing store in Philadelphia for over 70 years before retiring a few years ago, so we know exactly what it is like from the merchant end of accepting credit cards.I invite you to look through my website in which every word I personally wrote myself. I have tried to make it easy to navigate and provide the valuable information that you are looking for without a bunch of sales pitches and false teaser rates that other sites often have. Once you see what you like please complete either my I Want More Info form, the Application Apply Online Merchant Application Worksheet, email me at Kevin@mcvisa.com, or call me directly at 215-489-7878. At Credit Card Processing Services Our Professional Service Will Increase Your Bottom Line. restaurant at the top of Aspen Mountain during the 2007 rewards conference. United States. Also notice that at 5’8” that Kevin is the tallest in the group!